Martin O’Hagan was shot dead in Lurgan in September 2001. 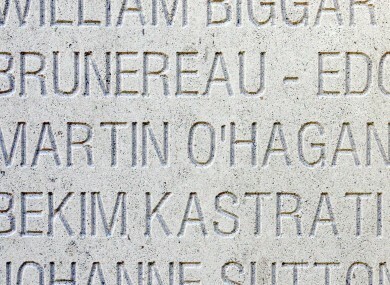 Martin O'Hagan's name on the Journalists' Memorial of Bayeux in France, which pays tribute to 2,000 reporters killed worldwide. THE INVESTIGATION INTO the 2001 killing in Lurgan of Sunday World journalist Martin O’Hagan has been referred to the Northern Ireland Police Ombudsman after public prosecutors decided they were no longer in a position to ask for a review of the sentence of a loyalist Supergrass. O’Hagan, who specialised in in-depth reports on the activities of loyalist paramilitaries, was shot dead as he walked home from a pub in the centre of Lurgan on 28 September 2001. Neil Hyde was arrested as suspect in the case, and agreed to assist the authorities in their investigation in return for a more lenient sentence. He was sentenced to three years in prison in February 2012 for a range of offences in connection with the murder, including ‘conspiring to carry a firearm with intent to wound’. The judge in the case told him that his sentence would have been 18 years if he had not agreed to identify those involved in the murder. However, the case against eight loyalists alleged to have been involved was later dropped because Hyde’s evidence could not be backed-up independently. The Public Prosecution Service had been asking the courts to review Hyde’s sentence, but has confirmed today that is not in a position to make that request. [...] following further examination of the evidence previously made available by police, extensive police enquiries and PPS consultation with the relevant witness, it is considered that the evidence which is now available is not sufficient to establish a breach of the agreement by Neil Hyde to the requisite standard. Accordingly there is no longer a basis to refer the matter to the court. The court has therefore been informed that the PPS no longer seeks the review of the sentence. The statement continues: “The referral follows a decision by the PPS to no longer seek a review of the sentence imposed on a man for his involvement in the murder of journalist Martin O’Hagan and other offences”. Email “Police Ombudsman to investigate 2001 killing of Sunday World journalist”. Feedback on “Police Ombudsman to investigate 2001 killing of Sunday World journalist”.